About the Author: Laurie Forest lives deep in the backwoods of Vermont where she sits in front of a wood stove drinking strong tea and dreaming up tales full of dryads, dragons and wands. 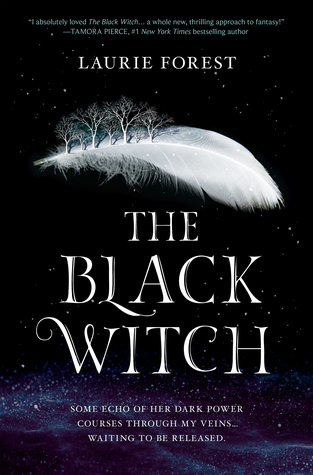 THE BLACK WITCH (Out Now - Harlequin TEEN, Book One of The Black Witch Chronicles) is her first novel, and WANDFASTED (THE BLACK WITCH prequel, Out Now - Harlequin TEEN) is her first e-book novella. Coming in 2018 are THE IRON FLOWER (Sept. 2018 - Harlequin TEEN, Book Two of The Black Witch Chronicles) and LIGHT MAGE (Spring 2018 - Harlequin TEEN, e-book novella). My Review:Reading this a second time was fantastic! I couldn't out it down and I loved being in this world yet again. I love that this world is so involved because of that it was almost like reading this like the first time. The characters are so vibrant and so real that I fell in love with each of them and really wanted to slap others. I love how Elloren goes from being a sheltered girl to being an advocate for whats right. She goes through so many changes in this novel and if you are one of those that have written this one off because of the issues that people say about it. You should really read it for yourself. Elloren starts out as somewhat predigest and closed minded but then her eyes are opened to this whole world and her thoughts and actions change so much during this story. She grows and becomes one of my favorite charters by the end of this. The story and world building in this one is so breath taking! I could not put it down and the author does a wonderful job with creating this enormous world. This book is one of the best that I have read with world building that if you were whisked away and found yourself there nothing would be missing. The pacing of the story flows so well that it takes you on a journey and doesn't let you go until the very end. Do I Recommend this book? Yes this is one of the best books I have ever read!